Take a trip to the seaside in Beach, a 5 reel, 20 payline video slot from NetEnt. This tranquil looking game comes with Octopus Wilds that can transform multiple symbols into wilds as well as doubling payouts. Look out too for the bonus feature where you can win up to 48 free spins. Go for a virtual paddle from between 20p and £200 per spin. As you’d expect given the title, the imagery in Beach has a definite look of the sea – symbols include lower value A to 10 pebbles as well as shells, starfish, oysters and a treasure box. 5 of the latter will get you a payout of 100 times your stake. The plank of driftwood is the standard wild – it appears on reels 1, 2, 4 and 5 and substitutes for everything apart from the scatter. More intriguing is the octopus wild that lands on the middle reel only. It too replaces everything bar the scatter. It also has the ability to swap the positions of any 2 symbols in adjacent positions on reels 2, 3 and 4 and create an even better winning combination. All payouts that feature the octopus wild are boosted by a 2x multiplier and doubled. If you were to get 4 treasure box symbols with a wild across a payline, you will win the maximum 200 times your stake win. The message in a bottle is the scatter and the key to triggering the Free Waves feature – 3 bottles will get you 8 free spins. 16 are on offer for 4 bottles with 24 awarded if you manage to land a full 5. You can re-trigger more free spins, in the same amounts, if more scatters float into view during the feature giving you up to 48 free spins (waves) potentially. 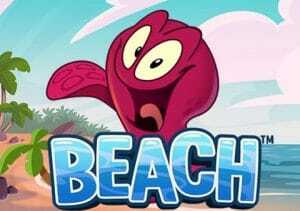 Beach is a simply designed video slot but one that works rather well – rather than spinning, the symbols float onto the reels on an incoming tide – each ‘spin’ is accompanied by the sound of a breaking wave. The features are similarly basic. The Free Waves feature is a good one and the wild octopus, complete with doubling multiplier, certainly spices things up in the base game. There are chances to win big too with top prizes of 200 times your stake (as described) theoretically possible. However, I found it to be a low to medium variance offering. If you’re after some virtual sea air, then you could do worth than sampling the delights on offer at this Beach. If you like the theme, Quickspin’s Spinions Beach Party is a better alternative and is a lot more volatile.